Looking for a fun, family-friendly experience in Orlando? Blue Man Group may just be the show you’re looking for! You and your family will enjoy experiencing the mystery, the humor and the euphoria that is Blue Man Group at Universal Orlando Resort and you will be mesmerized by the indescribable celebration of art, technology and music that Blue Man Group uniquely presents throughout the one hour and forty-five minute show. As soon as the show begins, you are drawn in to the captivating stage, astounding music and the incredible performances by this wonderful cast. You’ll find that the show packs quite a few surprises because the Blue Men don’t stay up on the stage during the entire show. The Blue Men love audience participation and just may bring an unsuspecting visitor or two up on stage to be a part of the experience! Uniquely combining science, high-energy and laughter, Blue Man Group makes for an explosive evening of entertainment the whole family can enjoy. It is no wonder that Blue Man Group has wowed more than 25 million people worldwide! Custom-built in 2006 exclusively for the Blue Man Group, the Blue Man Group Theatre is located in Universal CityWalk – The Entertainment Capital of Orlando. It’s also accessible from the Universal Studios theme park and a short walk from Universal’s Islands of Adventure theme park. Throughout the state-of-the-art theatre, you will find “Blue Man-isms” everywhere; just so you remember where you are! And while you’re walking through the theatre, be sure to keep your eyes open because you just may cross paths with a friendly Blue Man. The Blue Man Group Theatre comfortably holds 1,000 seats, all of which have a good view of the stage and cinema screens. The 30-foot Blue Man façade and lots of brightly colored paint ensure a unique, fun-filled experience for all ages. It is quite a walk from the parking structure to the Blue Man Group Theatre. It is recommended that you allow extra time for this lengthy walk, especially if you are traveling with children or are handicapped. If traveling with young children, I recommend bringing a small, lightweight stroller for your child to ride in – unless you don’t mind holding your little one for most of the walk that is! While the Blue Man Group show appeals to a wide audience, it may not be appropriate for all children under 3 years old. Universal Studio’s website recommends parents speak to a theatre usher for details and available child accommodations. The Blue Man Group Theatre is handicapped accessible with 13 ADA seats distributed throughout the theatre as singles and pairs. This allows for patrons to purchase additional seats next to each ADA location. Also, the theatre is equipped with assistive listening and descriptive narration programs for the hearing and visually impaired. Please call the Blue Man Group box office for details. Meal & Show Deal: Catch the performance and then enjoy a meal at one of the most unique and popular restaurants in Orlando, including Jimmy Buffett’s® Margaritaville®, and Pat O’Brien’s®. Call 407-BLUE-MAN to plan your night out, or click the link at the bottom of this article to purchase online. Free Admission to Select CityWalk Venues: Receive complimentary admission to select CityWalk venues with your Blue Man Group ticket stub. Valid only on the same day as your BMG ticket. Guests must present BMG ticket upon arrival to the host stand at their desired venue. Some venues require ages 21 or older for admission. Does not include admission to AMC® Universal Cineplex 20 with IMAX® or Saturday nights at Bob Marley – A Tribute to Freedom. Not valid on separately ticketed concerts or events. Blue Man Group Vacation: Enjoy this exciting vacation package featuring hotel accommodations, theme park admission and the euphoria that is Blue Man Group. You can also enjoy early park admission to experience Universal's Islands of Adventure and Universal Studios Florida. Same Day Military Discount: For all of our friends in the Armed Forces, Blue Man Group offers discounted tickets. Visit your local MWR, ITT, and ITR offices for details and to purchase. 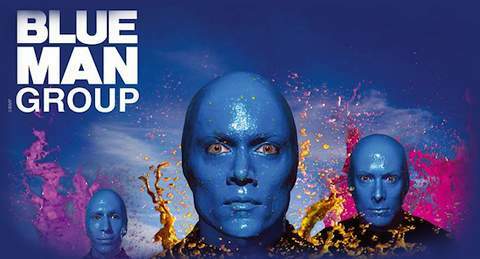 AAA Discount: Bring your valid AAA card to the Blue Man Group Orlando Box Office and get up to six discount tickets. Child Ticket Pricing: Children ages 3 to 9 years old can get discount tickets - $29 for tier 1 or 2, and $34 for poncho seats. Limit four (4) per paid adult ticket. Adult Ticket Pricing: Tickets start at $60 per adult (prices will vary according to where seats are located within venue.) Florida residents can also get discount tickets! Call 407-BLUE-MAN (258-3626) for more information. Single Park Combo Ticket: Enjoy Blue Man Group and either Universal's Islands of Adventure® or Universal Studios Florida®. Choose between 1-day, 2-day, and 3-day packages starting at $167 for adults and $111 for children. Park-to-Park Combo Ticket: Enjoy Blue Man Group, Universal Islands of Adventure® AND Universal Studios Florida® each day you visit. Choose between 1, 2, and 3-day packages starting at $192 for adults and $146 for children. Article by Steffany Skelley Gilmer. Copyright Sunny Harbor Publishing.